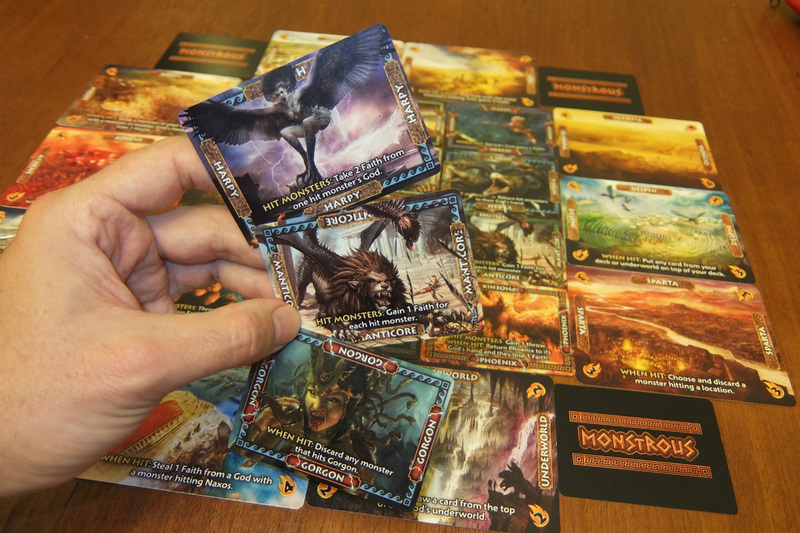 MONSTROUS (designed by Kim Brebach) is a tactical dexterity game featuring deluxe art from ancient Greek mythology. Players are wrathful Greek gods who stand and move around the table, literally throwing monster cards down at large ancient Greek location cards seen through god’s eye vistas, trying to restore Faith in the Pantheon. The tactics come from unique powers on the monster cards, and how they combine with powers on locations and other monsters they hit. The Greeks are losing faith, and the gods of Mt. Olympus are mad. To show their displeasure they’ve decided to visit the ancient world with a menagerie of mythical meanies in the form of manticores, hydras and even cyclopseseses(? ), all in the hope of re-instilling faith in the unwashed masses. That’s the pitch, but how does it work? Well, each player is given a monster card deck of mythic creatures with which they can attack five larger Location cards set up on the table. Players literally throw a card during their turn, with a ‘hit’ occurring if their monster card comes to rest on top of or beneath a Location card or a previously thrown monster card (once thrown, monster cards remain on the table from round to round unless removed by an effect). Players then score Faith points based on which locations they hit, plus through the unique special powers each monster possesses. The player with the most Faith at the end of the game wins, after losing Faith points for every monster card remaining in their deck, hand and underworld (graveyard). What makes the game really interesting is the powers on the monster and location cards. For the monsters, each card has a generic ‘Gain Faith when hitting Monsters and/or Locations’ side and a unique power based on the other. For example, the Hydra monster card puts all monsters it hits back onto their owner’s deck, whilst the Harpy takes 2 Faith from one monster’s owner that it hits. There’s even cheeky Trap powers that activate when the monster is already on the table and is hit by another monster card. Locations work in a similar way, activating when hit and granting bonuses like extra Faith or drawing additional cards. 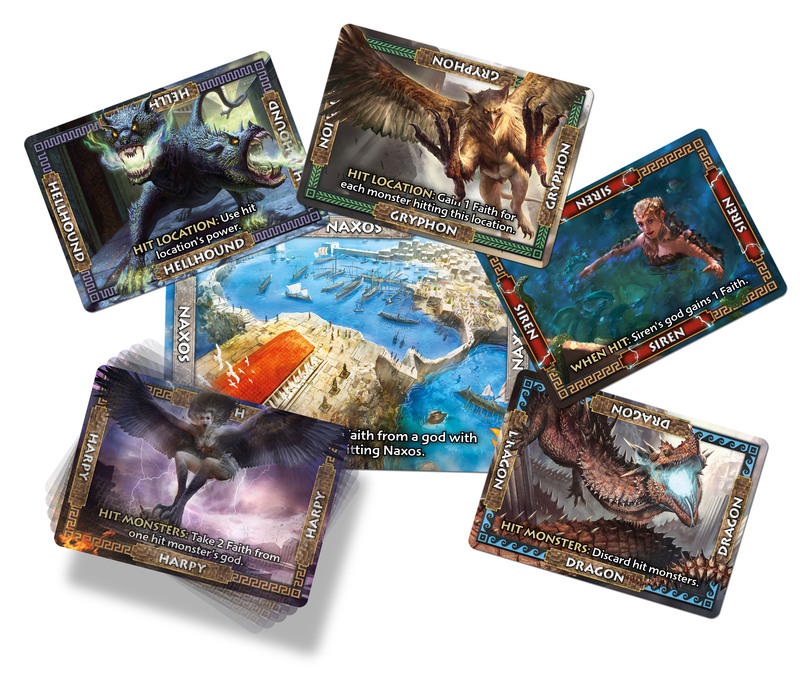 With 12 different locations and 12 different monster cards, the variety of play is excellent as no two games will be alike. Gameplay progression is also fantastic; as more monster cards litter the table, the playing area evolves and fluctuates, forcing players to change tactics from turn to turn. The clever decision to give each monster card a generic ability side also means every card is useful (unless you throw terribly and flip your card….not that I’d know…), and having the same monster cards in every player’s deck means the game is well balanced. Playtime is short and the ruleset is simple, making this an ideal game for younger gamers or as a filler to wind down an evening. It is a dexterity game, so practice is definitely required. I have to admit, dex games are not my thing and I tend to steer clear; this wasn’t helped by my first playthrough where all my cards were skimming off the table or landing in the no-man’s land between the Location cards, effectively gaining me nothing. But by the end of the second I started to get the knack and by the fourth I was willing people to go another round. If the fact it’s a dex game puts you off, I implore you to play it at least twice; once you get the hang of it, the fun factor really starts to shine through! Monstrous also doesn’t outstay its welcome, wrapping up in under half an hour after a brief rules read. We haven’t received the final version, but if the prototype is anything to go by it’s going to be amazing! The artwork is top-notch; well drawn, vivid colouring and beautifully realised on the cards themselves. The way some of the monsters look like they’re popping out of their card frames looks cracking and the linen finish means these cards will take the beating a dex game will put them through. The Faith tokens too are thick chipboard with intense yet simple graphics. If this quality is maintained in the final version, this will be one of the best produced games I’ve ever reviewed. I’ve really struggled to find anything about Monstrous that I disliked, other than the aforementioned aversion to dex games. If you put a gun to my head, it would be that the game prototype was supplied with a demonstration leaflet instead of a full rulebook. This led us to have to visit the creator’s website during certain events (for instance, what happens when your card goes off the table) which slowed down those first couple of playthroughs. The short version: A gorgeously produced dexterity game with plenty of variety and a straightforward ruleset, perfect as a gateway game or for more casual players. Back it. Back it now! I wholeheartedly agree with everything Bevan has to say, he’s nailed my thoughts exactly. I do want to focus on one thing though. Artwork. Seriously one of the best illustrated games I’ve ever seen and it’s SO MUCH FUN. If you’re thinking about a solid gateway/filler game then you’d be daft not to get a copy. Let me say straight off the bat, I’m not a fan of dexterity games. I am the reason we employ the ‘no drinks on the table’ rule. So when we were asked to review Monstrous, I was dubious at best. Well credit where it’s due, Kim was right, I thoroughly enjoyed playing Monstrous and despite not being the best thrower in the room, I was able to use the cards abilities to produce a great result (that’s right, I won!). The well thought out and balanced game play was complimented by the amazing artwork and the high quality finish of the game. Whilst I may not be a complete convert to dexterity games, Monstrous is one that I definitely would play again, it gets my spanner of approval. Monstrous gets a Tinkerbot Spanner of Approval from all 3 Tinkerbots, scoring it 3/3! 3 Responses to "A Monstrous Review"